There are many books, blogs and websites that offer writers advice when it comes to writing character descriptions: 'show don't tell'; 'less is more'; 'make the description tell us more about the character than just their physical appearance' etc. etc. Of course, by definition if you are writing fiction then the character exists clearly in your head and it is your job to communicate that to the reader, so that if they were asked to describe the character at the end of the novel they would come up with your character just as you imagined them. Writers of historical fiction often have a different problem they have to figure out for themselves in that the person they are writing about actually existed but there are either no contemporary likenesses of them or worse still there are sketchy ones available or vague descriptions (both on appearance and character) by contemporary writers which we may wish to believe or disbelieve depending on their relationship to the said character! The former does allow the writer more of a free rein to develop the character as their own, whereas the latter offers up a number of difficult choices. 1. 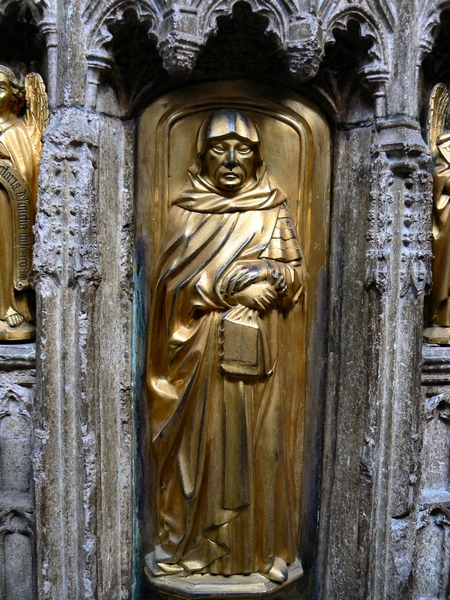 Probably the closest to life as he was involved in commissioning it in the 1450s: his depiction as a weeper on Richard Beauchamp's tomb in St Mary's Warwick. 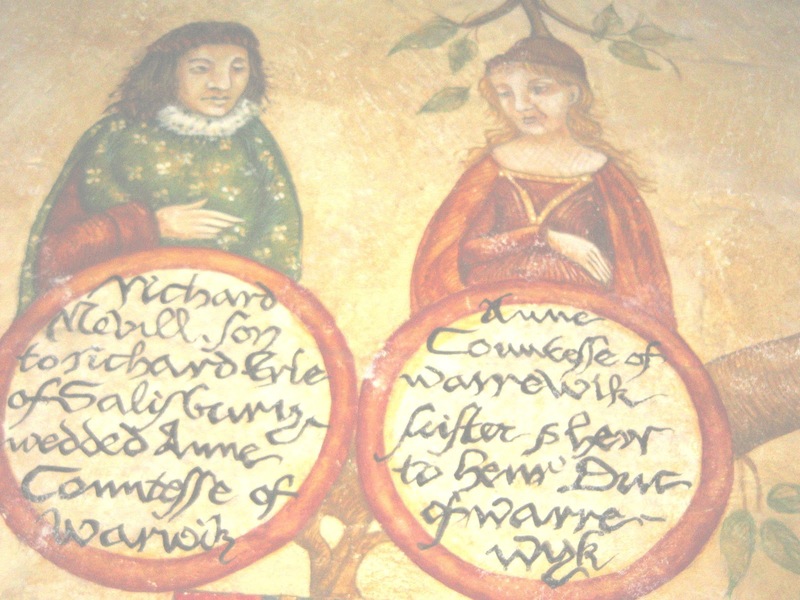 (Beauchamp was Warwick's father-in-law). This shows Warwick, perhaps symbolically, as an older man however, as he was only 42 when he died at the Battle of Barnet in 1471. 2. 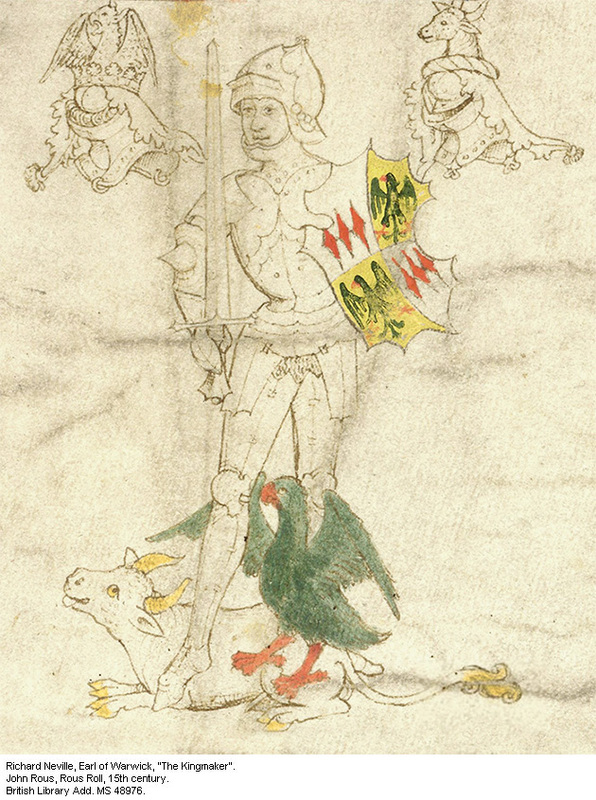 Salisbury Roll of Arms - completed around 1463 to mark the re-internment of his father at Bisham Abbey. Highly stylised and probably not a true likeness. 3. 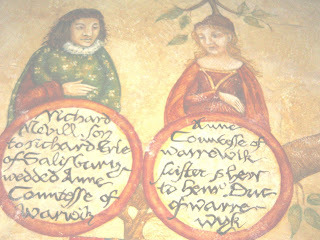 So-called Rous Roll compiled 1483-85 during the reign of Richard III and probably by Warwick's widow, the Countess of Warwick - again highly stylised and probably no attempt at a likeness. 4. The last page in the so-called Beauchamp Pageant almost certainly commissioned by the Countess of Warwick - some attempt at a likeness here as all the figures have different faces. (He is top left as we look at it, pointing towards his countess). And I have gone along with that colouring. 5.His death at the Battle of Barnet in the Besancon version of the Short Arrivall - painted some 10 years after the battle. He is fully armoured but appears quite tall. (Warwick is riding to the right on the white horse with a shield on his back). In addition the Neville family were generally regarded by contemporaries as being both handsome and tall and as a novelist that was one piece of information I certainly couldn't ignore!